Like previous ‘text bomb’ bug, the new flaw can easily be exploited by anyone, requiring users to send only a single character from Telugu a native Indian language spoken by about 70 million people in the country. Once the recipient receives a simple message containing the symbol or typed that symbol into the text editor, the character immediately instigates crashes on iPhones, iPads, Macs, Apple Watches and Apple TVs running Apple’s iOS Springboard.Apps that receive the text bomb tries to load the character, but fails and refuses to function properly until the character is removed which usually can be done by deleting the entire conversation. The easiest way to delete the offending message is by asking someone else to send a message to the app that is crashing due to the text bomb. This would allow you to jump directly into the notification and delete the entire thread containing the character. 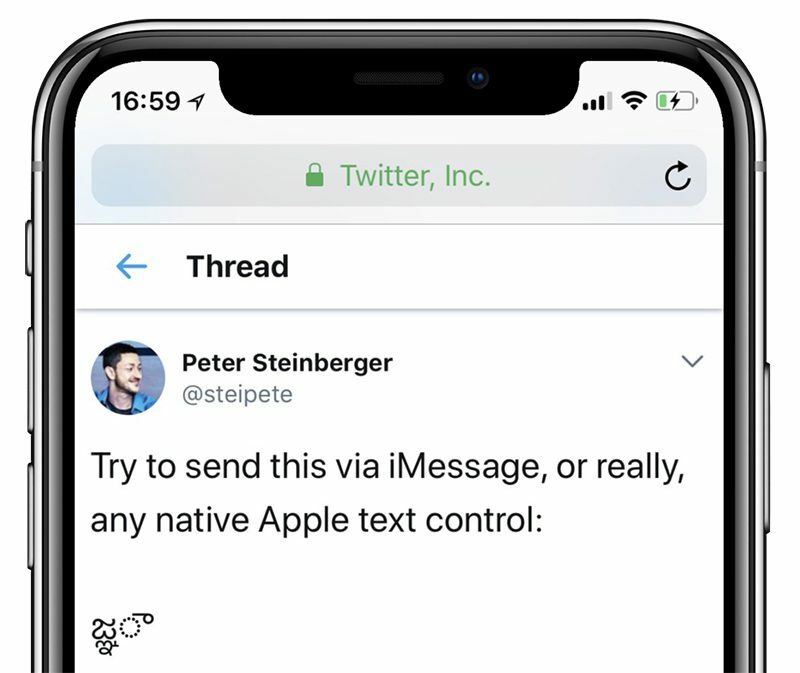 The character can disable third-party apps like iMessage, Slack, Facebook Messenger, WhatsApp, Gmail, and Outlook for iOS, as well as Safari and Messages for the macOS versions. Telegram and Skype users appear to be unaffected by the text bomb bug. Apple was made aware of the text bomb bug at least three days ago, and the company plans to address the issue in an iOS update soon before the release of iOS 11.3 this spring.The public beta version of iOS 11.3 is unaffected. Since so many apps are affected by the new text bomb, bad people can use the bug to target Apple users via email or messaging or to create mass chaos by spamming the character across an open social platform. Apple released iOS 11.2.6, the eleventh official update to the iOS 11 operating system. iOS 11.2.6 comes approximately one month after the launch of iOS 11.2.5, an update that introduced support for the HomePod, Control Center updates, Siri news, and a slew of bug fixes. The iOS 11.2.6 update can be downloaded for free on all eligible devices over-the-air in the Settings app. To access the update, go to Settings –> General –> Software Update. Apple released iOS 11.2.6 to address a bug that causes apps like Messages to crash on the iPhone and iPad due to an inability to render a specific character in the Indian language Telugu. When sent, received, or input into Messages, Safari, WhatsApp, Facebook Messenger, and more, the Telugu character can cause the app to freeze up and become unresponsive. Apple fixed the bug in iOS 11.3 and macOS 10.13.4, but those updates are still in beta testing and won’t be released until the spring. Apple last week promised a minor update to fix the bug in the meantime.